First seal coat of oil. The Adirondack guide boat is stripped, cleaned and repaired. 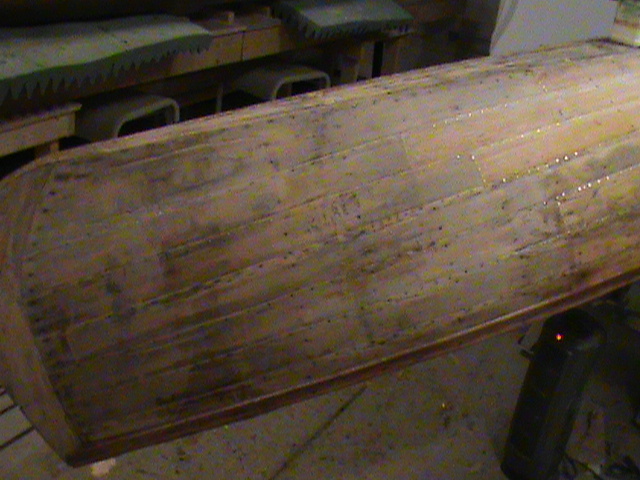 I have added the first coat of oil and varnish solids to the boat thinned to 50/50 so I get good penetration into the wood. 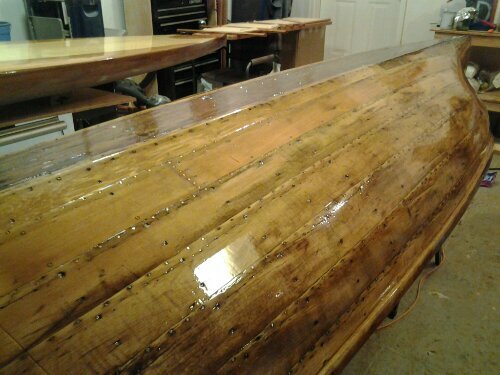 The look of the 100 + year old wood that makes up this boat is amazing with incredible depth and character. In some locations the wood is worn from use by a rower from years past and there are patches, scratches and rubs all along the boat revealing that this was once used as a regular useful tool. The stripping process has been completed on the outside of the Adirondack Guide Boat. I have removed over a dozen fiberglass and epoxy patches. The layers of varnish are also removed along with quite a bit of wood filler. 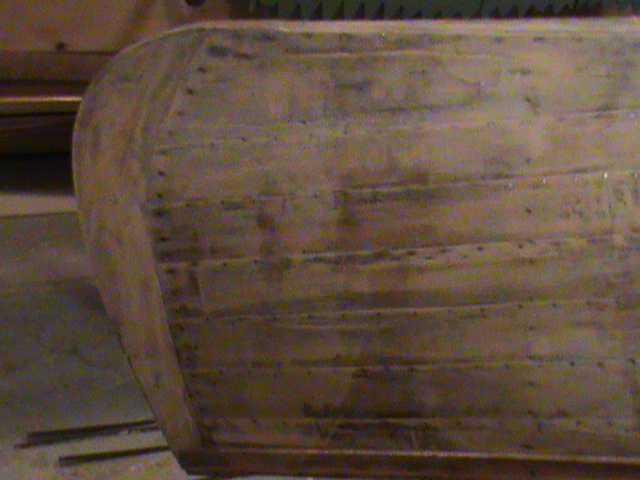 The structural integrity of the boat is nicely intact and the repairs made with the wood filler were mostly intended to be cosmetic or to stop minor leaks. The color of the wood indicated many years of service and exposure. It also reveals an old and extensive repair to one side of the boat. Whoever made the effort to repair this boat in the past replaced several planks and ribs. This work surely saved this boat and kept it in serviceable condition for our current refinishing process. I have begun stripping the interior hoping the process will remove all the old varnish. 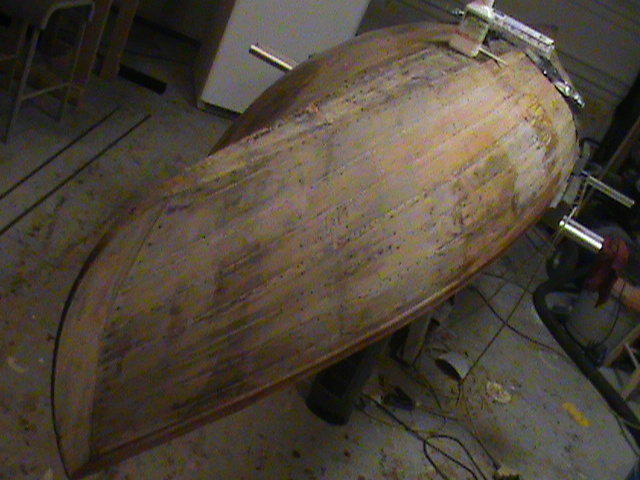 The ribs will make the interior more time consuming but I am hopeful the results will be similar to the outside hull and that no major problems will come up. I do not see any glass on the interior and that is very, very good since interiors of boats will pool epoxy. Wood working will follow stripping along with seating all the screws and clinch pins that are out of sorts after all the years. Stay tuned for pics coming up soon. This old boat is covered with layers of varnish, fiberglass tape and epoxy. The wood had aged and discolored due to water exposure, UV damage and the tannin in the wood reacting to the metal fasteners. The natural aged colors of the wood will be left on the boat rather than try to bleach them away or restore a color closer to original. Less is more and the colors of these boards surely show the age of this boat. The varnish layers and patches of glass and epoxy are coming off fairly well with heat and stripper. It is a slow process but the layers are coming off revealing that the patches were worse than the original problems. The brass rub rails and stem tips are removed and the varnish layers will be cleaned off but again, the years of patina will remain and the brass reattached with the deep brown color remaining. Most of the screws are reusable and will be part of the boat when reassembled. There is also quite a bit of wood filler covering sunken screws, clinch pins, slight depressions and surface cracks that are very normal for a wood boat of this age. The filler will need to be removed to restore the true nature of the boat. 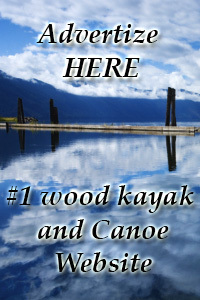 Proper sealing and finishing of the wood will do the job of waterproofing the boat that the addition of wood filler was wrongly intended to do. 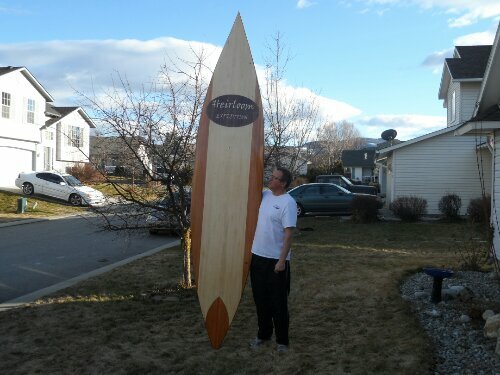 Stand Up Paddle Board by Heirloom Kayak. 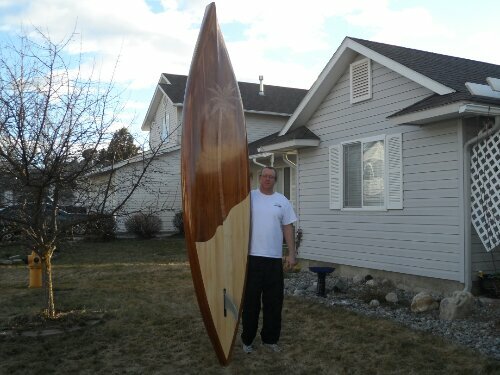 New displacement hull Stand Up Paddle Board designed by Heirloom Kayak.